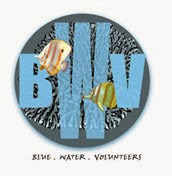 Today is the last session of the Naked Hermit Crabs' April Pasir Ris Mangrove guided walk. We had about 30 visitors with us today. 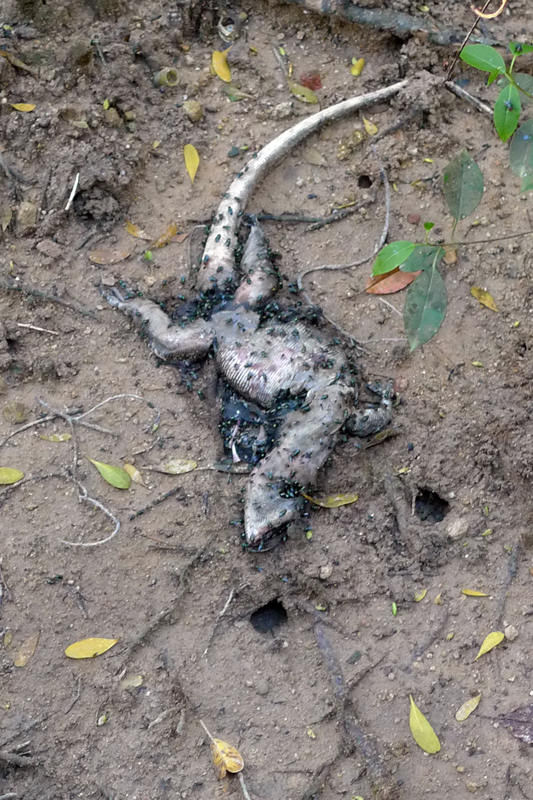 Many exciting things were seen, including a dead water monitor lizard. Just before the trip started, Ley Kun found the kapok tree. (Sorry, no pictures from me) When the fruit of the kapok tree explodes, it releases fluffy materials that feels like cotton wool. If I am not wrong, my parents used to buy these fluffy materials from shops to make pillows. 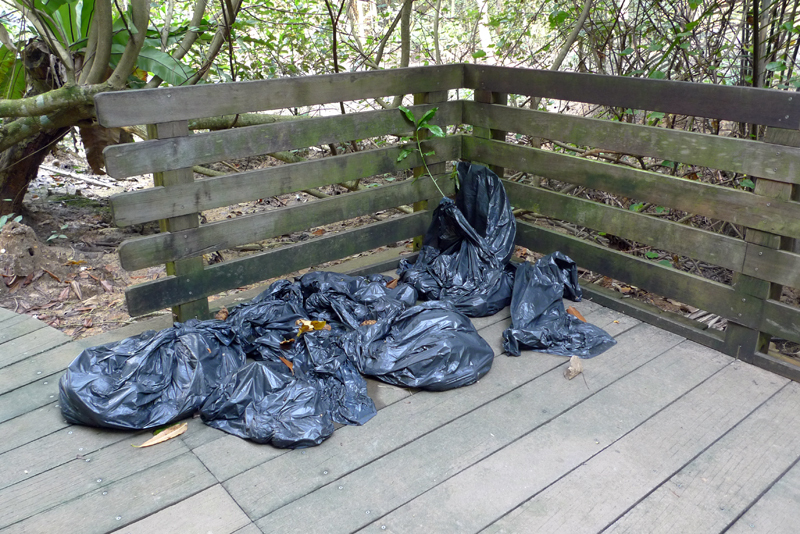 Right at the first bend of the mangrove boardwalk, there were a cluster of garbage bags placed at one corner. A plant in a trash bag??? 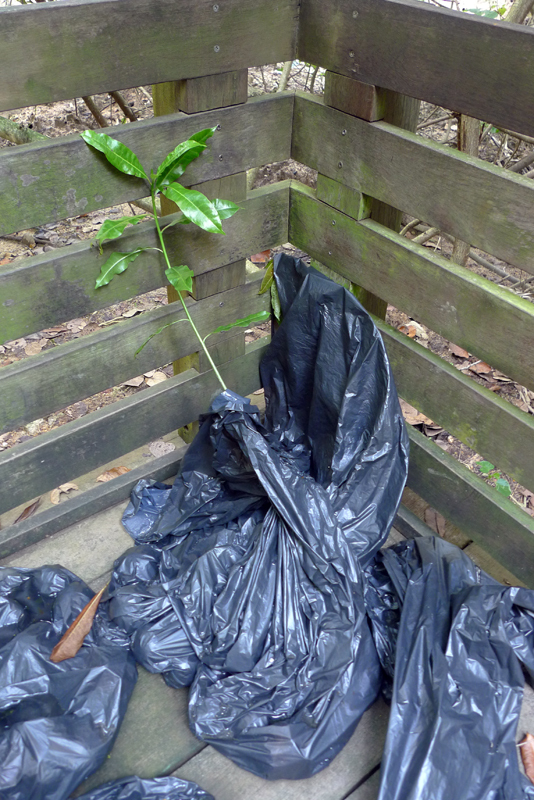 What is the plant doing in the trash bag? For any cleanup operations, the organsiers must inform the participants that leaves/branches/plants/food should be left alone. They are not trash. Leaves, branches or plants (dead or alive) are part of the natural cycle and they return nutrients back to the soil when they decompose. To any readers reading this, do remember not to pick up any of these items when you are doing cleanups. Just after the first turn on our guided walk route, our group noticed a dead malayan water monitor lizard in the mangroves. It was covered with many feeding flies. We thought of Ivan, who does Monday Morgue. There wasn't much decaying stench at this point of the boardwalk. However I did get decaying smell at certain points along the boardwalk after that and I was not able to find any other dying organisms. Right after the dead water monitor lizard, we came across some hovering insects at eye level on the boardwalk. They were too small for pictures to be taken. No idea what they are. 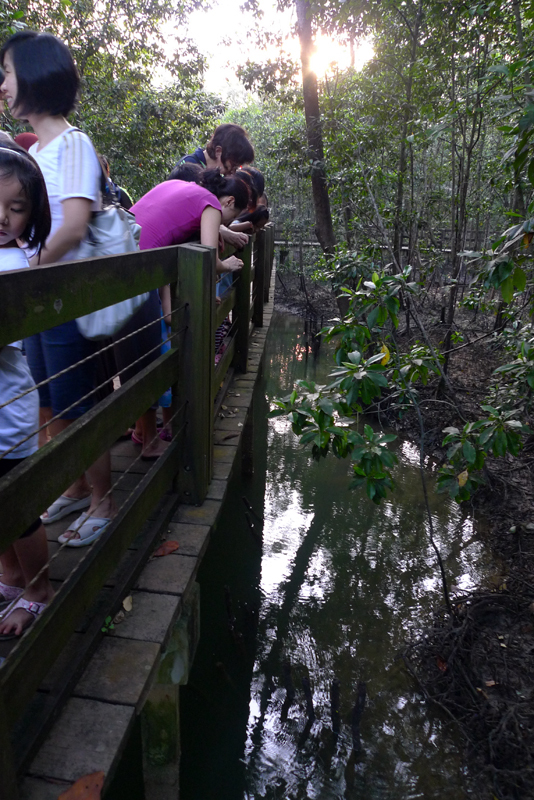 I would describe Pasir Ris Mangrove as an organism magnified of Chek Jawa. 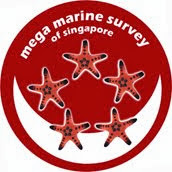 The crabs and mudskippers are much larger in Pasir Ris. 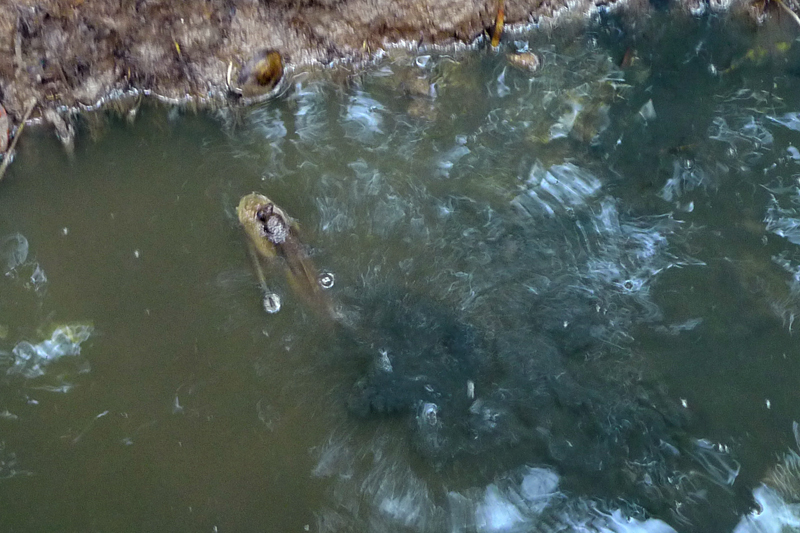 There are many giant mudskippers at Pasir Ris. Every point or corner, you will be able to spot the giant mudskippers. They looks as long as an adult foot. Towards the end of the boardwalk is where the bird watching jetty is. It a good place to look at the grey herons flying around and also the other birds such as barn swallows, kingfishers, night heron, waterhen. The highlight of today's trip will be a small sized Dog-faced watersnake (Cerberus rynchops) near the jetty. I found the snake and noticed everyone to have a look. It was a good sight for both the adults and children. It was a great evening. Uncle Anwar (I assume this is the correct spelling) told the guides that he saw 4 otters swimming in front of the jetty before we came. Darn! Missed the opportunity. I have never seen a wild otter personally. So, finding the watersnake was good enough for me. Today, the visitors had rather close encounter with the grey herons. One of them perched on a tree right opposite the jetty. There were a few who were flying past the jetty. Usually, we see the grey herons coming in from the seaward direction and they hardly fly past the jetty. 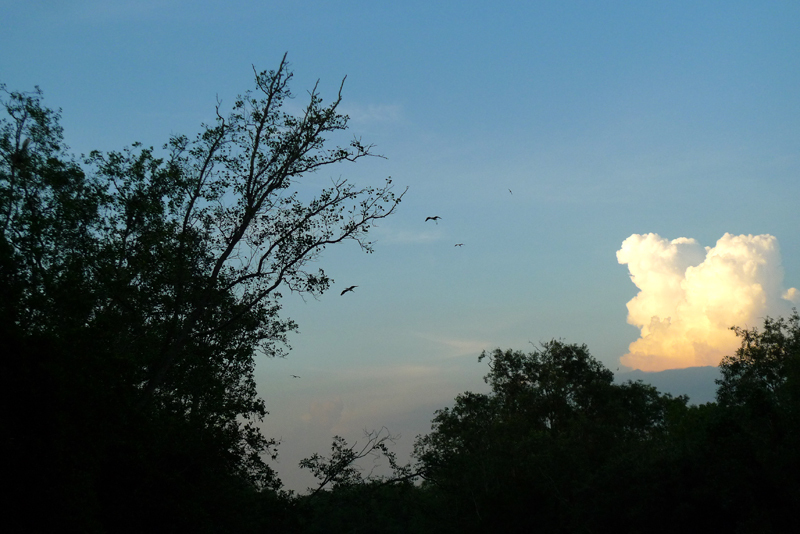 No luck for hornbills though. It looks a bit like the scene from Jurassic Park. It was a hot, humid but great guiding trip today. Today we had Ria, Ley Kun, Brandon and I for guiding.